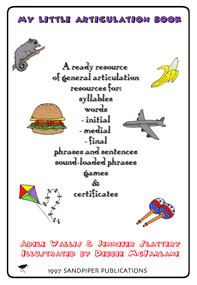 This resource provides all the material you need to easily and quickly provide articulation programs to teachers or parents, for all single consonant sounds, consonant blends and vowels. The great pictures, game boards, certificates etc. have immediate appeal to children. The comprehensive and clearly written instructions make it easy for parents or volunteers to implement. It is ideal for both the speech pathology clinic and schools. The section of consonant blends also contains lists of words that start with the blends and another list of words for blends at the end. The section for vowels has a list of words with each of the target vowel sounds in CV; VC; CCV; VCC; CVC; and CCCVCC. There is also a minimal pair list of words which looks at CVC type words going through all consonant combinations from ‘bib’ ‘bob’ and ‘babe’ to ‘zig’ and ‘zag’.